Driving through luxury condo and townhouse lake communities in Chandler offers a very diverse and even international feel in January when you see as many out of state license plates as Arizona plates. The many Chandler lake communities offer a peaceful setting and typically a golf course is not too far away. This is a great alternative for the many part time residents looking for an escape from freeezing temperature and blizzards in the midwest and Canada. 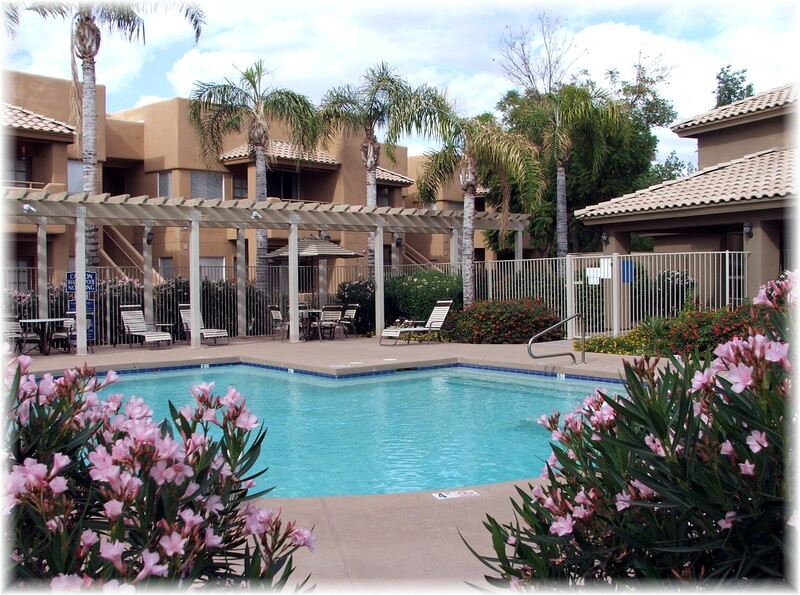 Cantabria Shores in Chandler is located right next door to the Ocotillo Golf Resort. Surrounded by man made lakes and scenic golf course views, this condo lake community is a favorite among out of state owners who are golf enthusiasts. Floor plans range in size from 1,100 to 2,217 sq.ft. and offer 1 or 2 car garages. 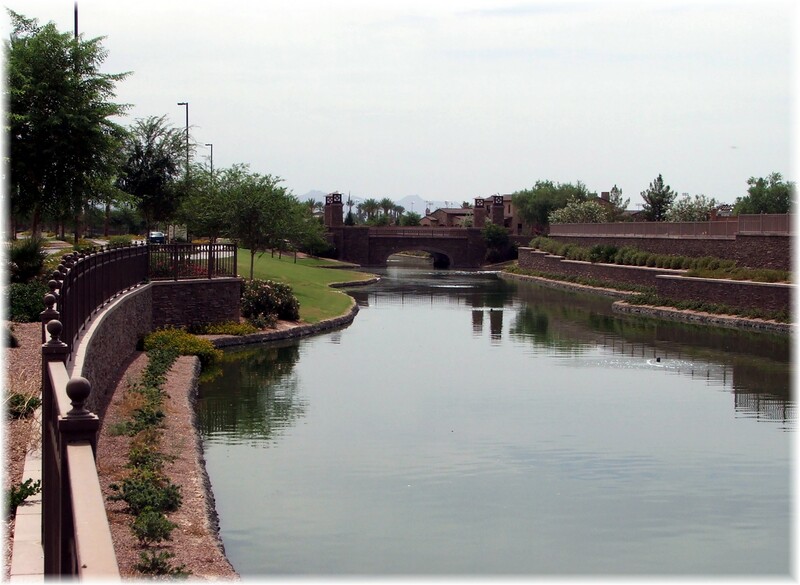 Fulton Ranch in south Chandler is the newest master planned lake community in the east valley. Two townhouse communities are nestled inside of Fulton Ranch, Serenity Shores and Crescent Falls, both built by Cachet Homes. Both communities enjoy amenities such as a community pool and spa. Located near convenient commerical and retail developments, Fulton Ranch is also close to the 202 freeway making the Phoenix area very accessible. The Bridges at Ocotillo was built by award winning Starpointe Communities during 2003 – 2006. The development is also located within the Ocotillo master planned community boundaries. The waterways wind throughout this community that features floor plans from 1,226 to 1,805 sq.ft. with a two car garage. The location, just 2 miles from the 202 freeway and a little over 5 miles from the Chandler Fashion Mall, is convenient to everything you need. And the east valley offers an abundance of golf courses. Location of The Bridges. 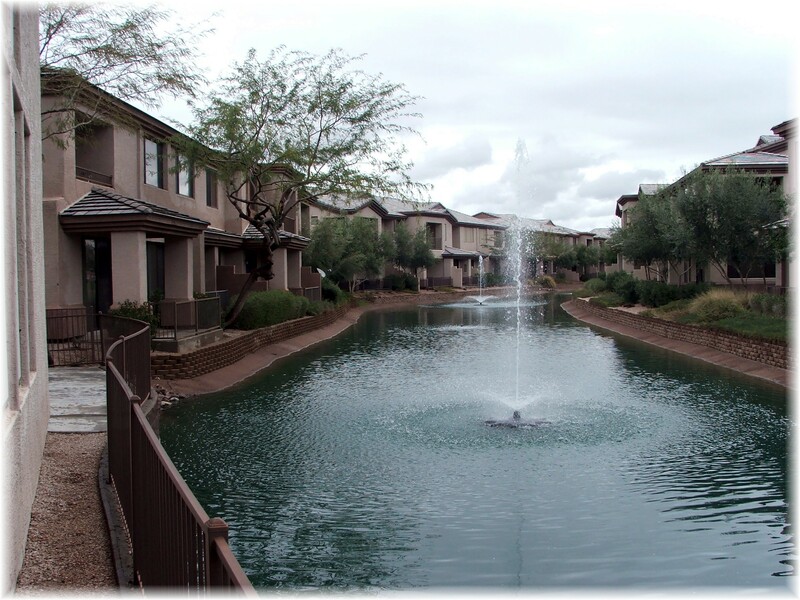 The more economical Chandler condo lake community, Andersen Springs was built in 1989 around a 10 acre man made lake at the southeast intersection of Dobson and Ray. Instead of garage parking, covered carports are provided. Residents enjoy 3 community pools, a tennis court, clubhouse and fitness center as well as scenic lake views. Buyers can find one and two bedroom condos under $100,000. Satellite view of Andersen Springs.